'Tis the season for giving so I created this little Holiday gift for you! 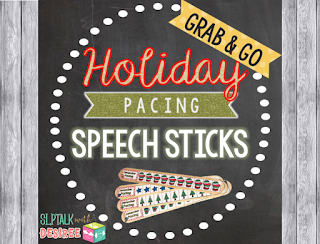 These December Holiday Pacing Sticks are a fun addition to your therapy room. They can be easily assembled by simply laminating or gluing onto paint stirrers or giant craft sticks. •Have the child travel down the stick as (s)he says each word in a self-generated sentence. •Have the child segment syllables, touching a picture for each syllable. •Have the child segment sounds within a word as (s)he touches a picture to represent each sound. •Have the child travel down the pacing stick saying the stimulus word each time (s)he touches a picture. •Use a clothespin on the stick to track “points” or turns taken within a session. •Use the stick as positive reinforcement to recognize when a targeted social skill is observed in a session. •Use small pieces of play dough to smash down along the stick in lieu of pointing or moving a clothespin. To Assemble, print image pages on yardstick. They are offered in both color or B&W. 2) Glue or Mod Podge the pacing strips onto paint stirrers or wide craft sticks for extra stability. Then paint an extra layer of glue/Mod Podge over the strips to seal them or use clear spray paint. This is personally my preferred method for long term use. I have had great success with having paint stirrers donated when I explained that I was using them with my students. (Extra tip: Home Depot also offers blank paint stirrers for purchase. A 10 pack costs $0.98). 3) Laminate the strips and apply Velcro to the back of the strips and to paint stirrers so that you can use the paint stirrers for extra stability but you can switch out what strips you adhere to them. I find that attaching one Velcro dot to each end of the strip does the trick! Thank you for stopping by! I hope that you enjoyed my little holiday gift to you! Please feel free to share this with a colleague if you think it may be useful for them so they can download their own copy I hope that you enjoy a magical holiday season! P.S. 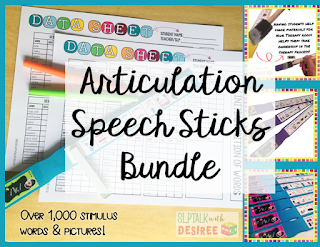 If you like these, you may also love my Articulation Speech Stick Bundle or Sight Word Sticks Craftivity Bundle. (Can you tell I like an alternative to playing 52 card pickup with cards?). You can find them by clicking on the photos below.